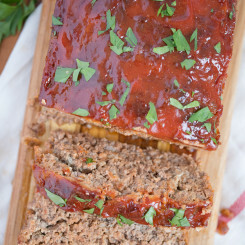 This Classic Meatloaf recipe was my dad’s claim to fame, at least in our house! It’s tender and juicy and has a uniquely delicious flavor. 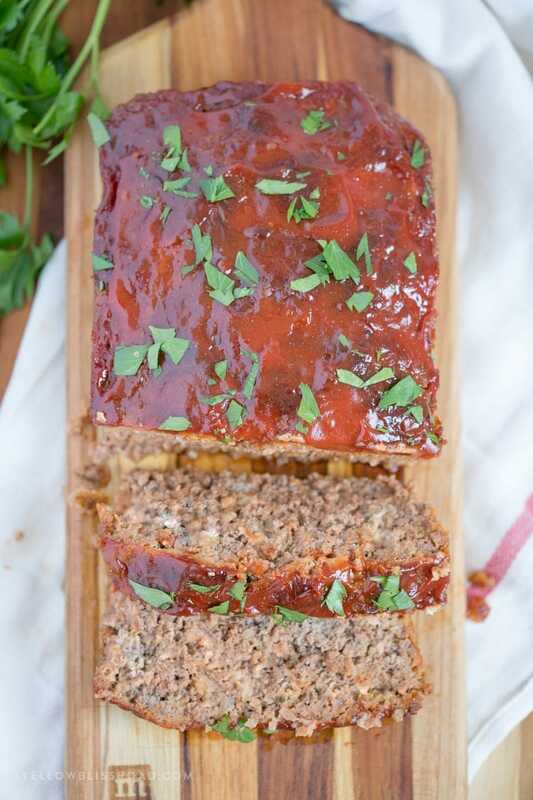 The brown sugar and ketchup glaze just puts this meatloaf over the top! When I was in about 5th grade, my dad was put on permanent disability due to some health issues. So my mom was the one who went to work and my dad stayed at home. It was an unusual dynamic in those days (which makes me sound very old). When I was a kid it was becoming common for both parents to be working and it was really unusual to have a parent at home, my less the dad. 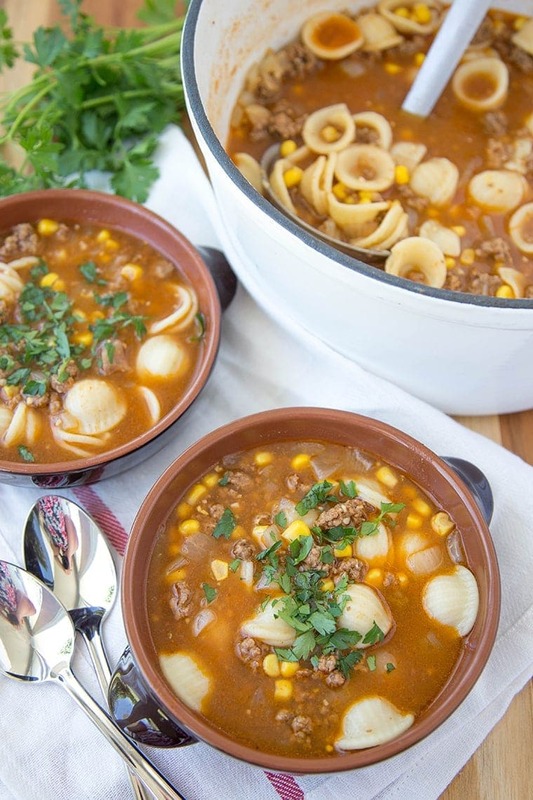 Given our family dynamic, my dad was the one who did a lot of the cooking. He had a few specialties though, that I remember fondly and love to recreate, like this classic meatloaf recipe. 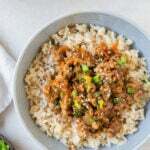 It’s a simple meatloaf recipe, but he definitely had his own twist to it. For example he used Porterhouse Seasoning, which I don’t see a lot of now but you can find it in the spice blends section of your grocery store. It’s a great dry rub for meats, especially beef and is a blend of salt, garlic, onion, black pepper, oregano, paprika, parsley, celery, rosemary. My dad made the best meatloaf, but it was just slightly different each time depending on what we had on hand. One of the big swaps he would use is oats versus crackers. 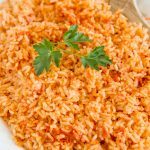 If you are going to use oats in your meatloaf you want to use Quick Cook Oats; the regular oats just won’t work the same. But most often he used crushed up crackers, like Ritz or Townhouse. That’s how I’m writing the recipe, but you can swap out for another binder like the oats or even breadcrumbs if you like. The biggest flavor bump in this meatloaf recipe is the Porterhouse Seasoning. 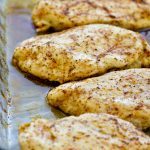 If you can’t find it you can sort of put together your own or use a similar spice blend…or just plain salt and pepper if you like. 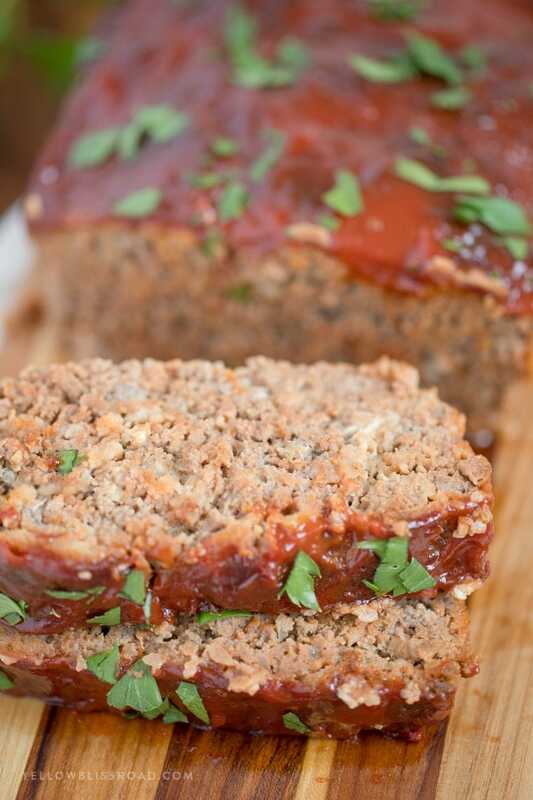 One of the keys to a good meatloaf is the mixing – do not over-mix or you could end of with a tough meatloaf. I like to add a glaze to the top although my dad didn’t do this. I think he kind of like the crunchy bits you end up with on top. 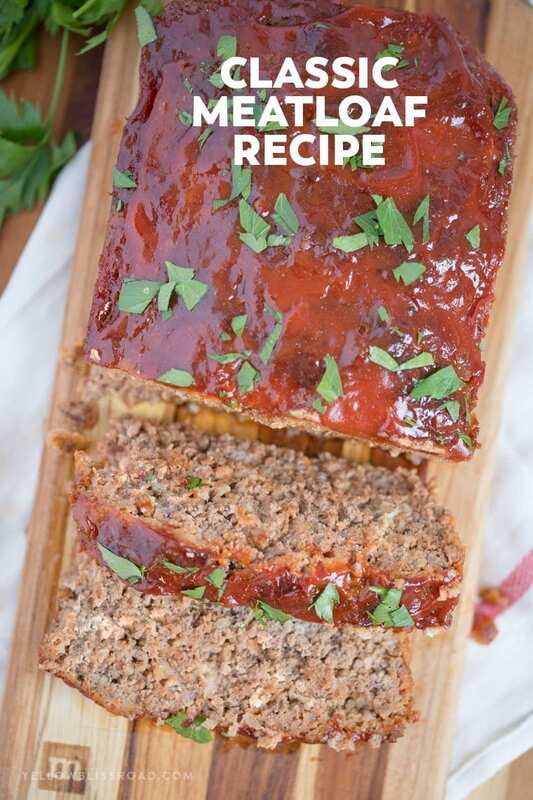 But the glaze helps to keep the top moist and tender and adds a delicious bit of flavor, so it’s my little twist to Dad’s Classic Meatloaf Recipe. One of my biggest pet peeves about meatloaf is when the juices all pool at the bottom and soak up into the meatloaf at the bottom making it a little greasy. I recently purchased a Meatloaf Pan (seen above) and I love it! 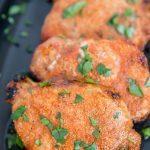 It was pretty affordable and is a great tool to have if you have a family of meatloaf lovers like we do. It also makes it really easy to lift the meatloaf out of the pan to slice. 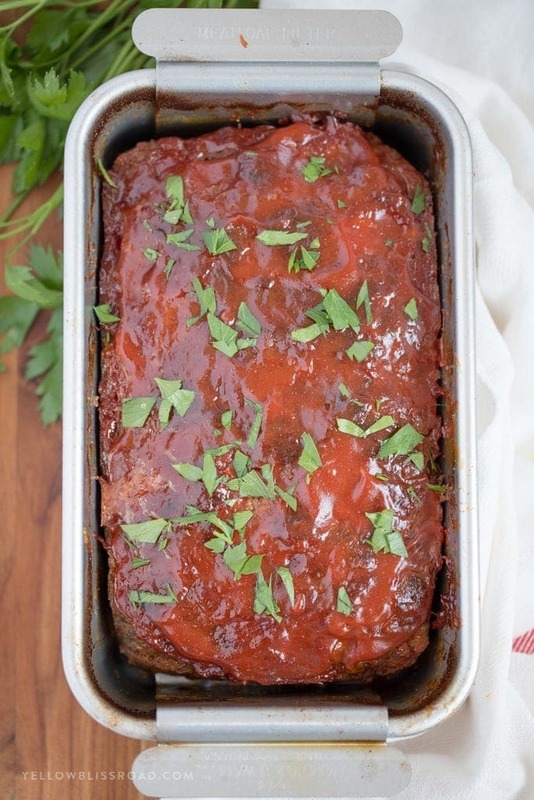 This Classic Meatloaf recipe was my dad's claim to fame, at least in our house! It's tender and juicy and has a uniquely delicious flavor. 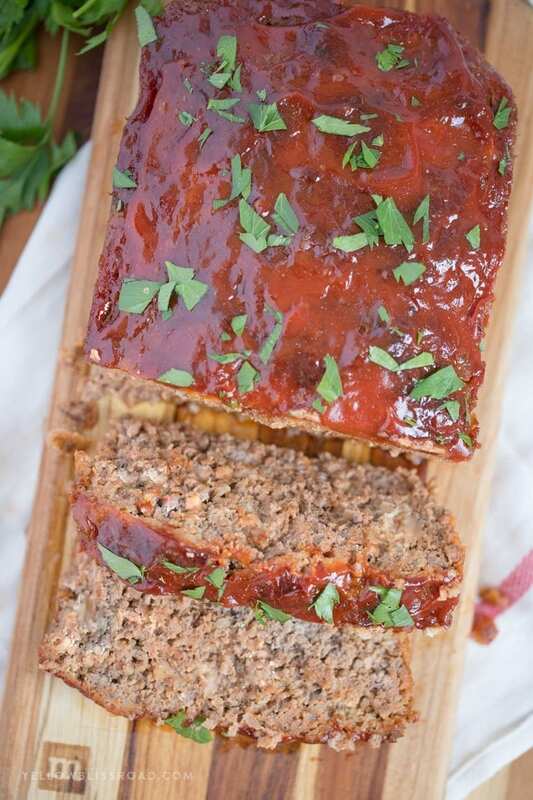 The brown sugar and ketchup glaze just puts this meatloaf over the top! Preheat oven to 350 degrees F. Spray a 9”x5” loaf pan with nonstick cooking spray. Combine meatloaf ingredients in a large bowl using your hands, just until combined. Do not overmix - The less you mess with it, the better it will be! Shape into a loaf and place into a loaf pan. In a small bowl combine 1/2 cup ketchup, brown sugar and mustard. Brush about 1/3 of the mixture over the top of the meatloaf. 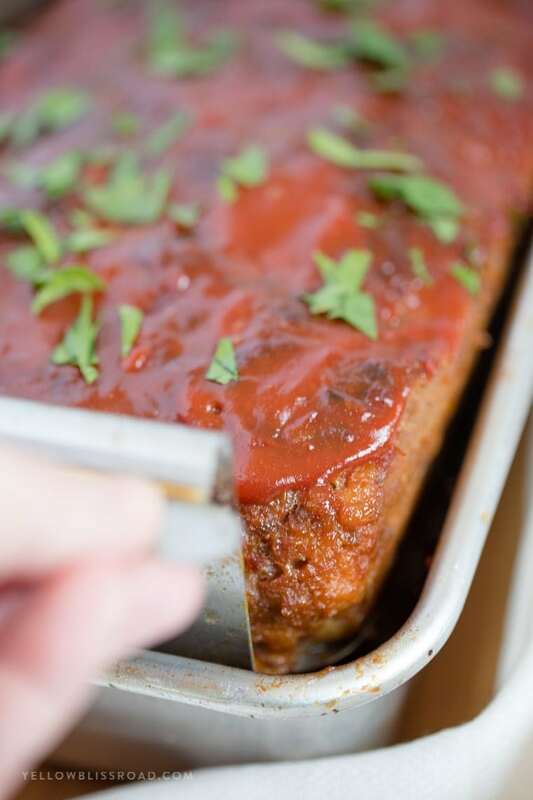 Bake in the preheated oven for 45 minutes, then pour remaining sauce over the meatloaf. 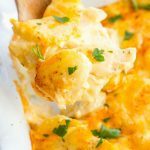 Return to the oven and bake for an additional 15-25 minutes or until meatloaf is completely cooked through. 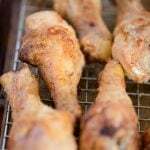 Meat should register between 155 and 160 degrees F.
Let stand for 5-10 minutes before slicing and serving. Garnish with parsley if desired. 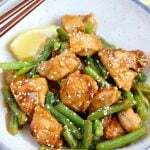 Hi Kristin, I love you recipes, they are quick and easy and so delicious my Son’s favorite is the stove top chicken breast. 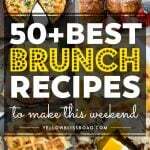 Keep putting out those great t recipes.